Hanging out with other international travelers broadens your world a little bit each time. I’ve been missing my dear new friends, the very fashionable british blogville babes Frankie @frankiestyling, Akeela @actuallyakeela and Katie @katieantoniou. So I thought I a post on a theme that they inspired would be fitting. We learned from our british blogville babes that the deliciously spicy greens that we were enjoying in Italy were not just plain Arugula (as we boring Americans label it) but should actually be referred to as “Rocket”. It didn’t take much to win me over for this name change. Personally, I think “Rocket” is a name much more in keeping with this crisp, spicy, slightly bitter green that helps any salad have that extra oomph of flavor. We had rocket with our meals nearly every day in the beautiful city of Bologna– as a large salad by itself, underneath the primi piatti as a delicious heaping base and as a simple side garnish to a caprese salad with creamy fresh mozzarella and a dribble of heavenly sweet balsamic vinegar (My new balsamic addiction is from Acetaia San Giacomo– a small farmstead producer of deep brown vinegar with a rich flavorful sweetness). There’s something so satisfying about that spicy crunch, the deep green of the spiky leaves, accompanied by their fresh clean scent as you raise the fork to your mouth. I always feel both supremely healthy and decadent at once when eating my fresh rocket salad. (Here’s a link to some mouth watering rocket salad recipe ideas). I’ve been back in the states a week or so and I’ve already been missing my daily dose of “rocket”, so I decided to order out from one of our fine local restaurants Cafe Aroma (@cafearoma1) and feed my addiction. 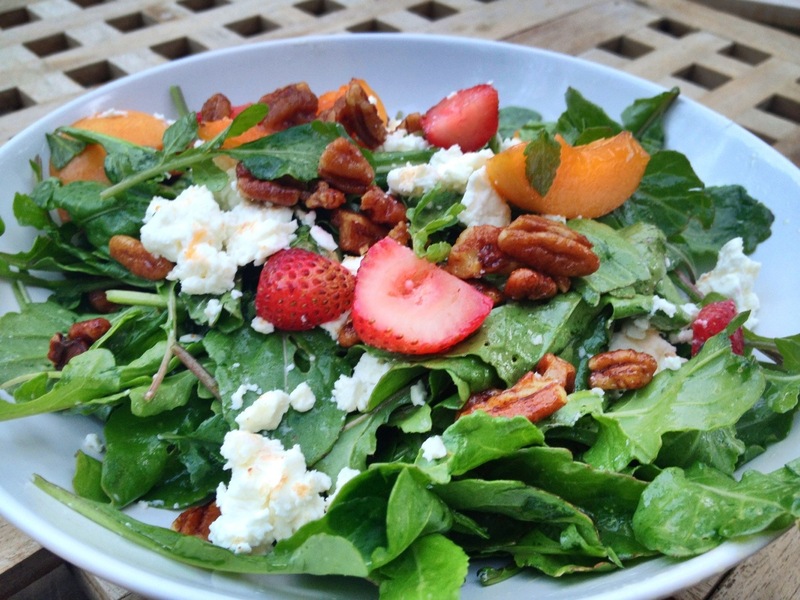 Behold (below): fresh wild rocket salad topped by goat cheese, candied pecans, strawberries, peaches and a balsamic vinegar dressing. Delizioso! Transported back to Italy for the night, I leaned back in the teak chair on my back porch savoring a grass of red wine and my wild rocket salad. Next mission? Head over to the market tomorrow to stock up on some more rocket- hopefully the clerk won’t look at me too strange when I ask for it! Want to make a healthy, tasty salad? Walk right past that nutritionally bereft iceberg lettuce (I call it “crunchy water”) in the produce aisle and straight head over to the Rocket. Arugula (Rocket) is a nutritional powerhouse of a green. It has many vital phytochemicals, anti-oxidants, vitamins, and minerals that can immensely benefit your health. Rocket is abundant source of phytochemicals such as indoles, thiocyanates, sulforaphane and iso­thiocyanates. Together these phytochemicals have been found to counter carcinogenic effects of estrogen. This helps protect against prostate, breast, cervical, colon, ovarian cancers by inhibiting cancer cell growth, and cytotoxic (killing) effects on cancer cells. In addition, the di-indolyl-methane (DIM) in this great green helps your immune system regulate itself properly and has anti-bacterial and anti-viral properties. Like spinach, rocket is an excellent source of vitamin A (in the form of Beta Carotene). Vitamin A and flavonoid compounds in in green leafy vegetables help protect from skin, lung and oral cavity cancers. So, before you think about slathering on potentially chemical laden sunscreen to protect from skin cancer, make sure you build up your body’s own defenses first. 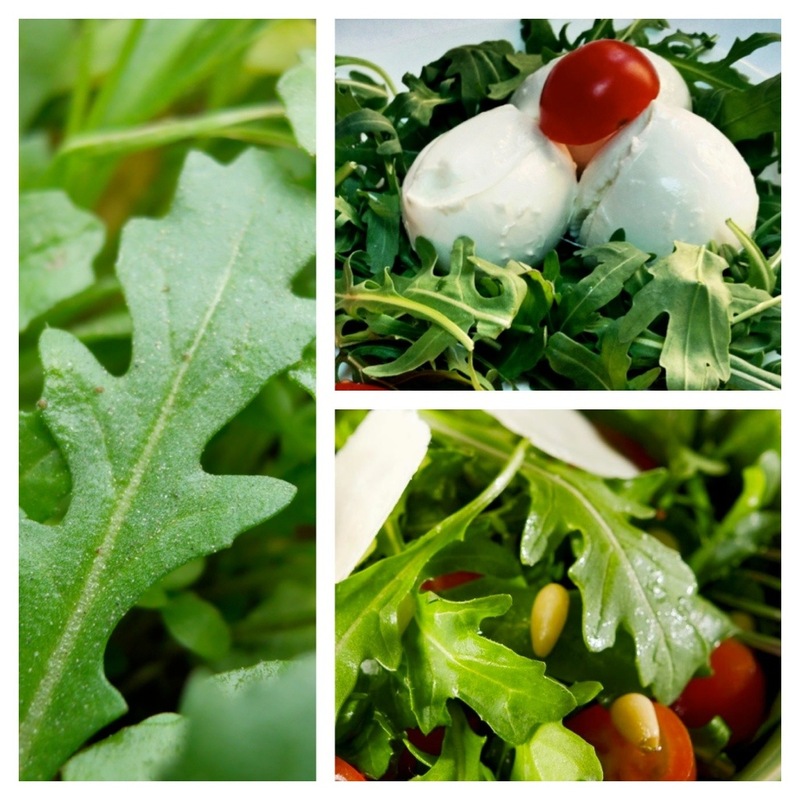 Fresh rocket leaves also contain good levels of vitamin C, a powerful, natural anti-oxidant. Foods rich in vitamin C help your body fight against infectious agents (boosting your immunity) and remove harmful, inflammatory free radicals from the body. Arugula is also a good source of minerals, especially copper and iron. It has a mix of small amounts of some other essential minerals and electrolytes such as calcium, iron, potassium, manganese, and phosphorus, all of which play critical enzymatic, chemical and structural roles in the body. Whew! All in all, that’s pretty good for a small spiky green leaf!